For those just learning to crochet it is best to start with a small project. One of my favourites is the Granny Square. 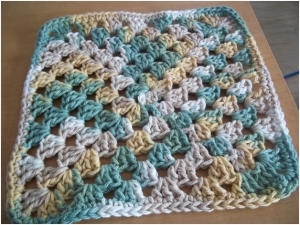 I have made several afghans with Granny Squares, but here we will just concentrate on a single one. This single square will serve as a dishcloth for all your dishwashing needs. The pattern provided calls for variegated yarn, but solid colors work equally well. For the adventurous crocheter, each row may be a different color, or two colors may be alternated. The possibilities are endless. Round 2: Ch 3; 2 dc; ch 2; 3 dc in ch 2 space. *Ch 1; 3 dc; ch 2; 3 dc in next ch 2 space. Repeat from * 2 more times; ch 1; join in top of ch 3 with sl st; sl st to ch 2 space. Round 3: Ch 3; 2 dc; ch 2; 3 dc in ch 2 space. *ch 1; 3 dc; ch 1 in ch 1 space; 3 dc; ch 2; 3 dc in ch 2 space* Repeat from * to * 2 more times; ch 1; 3 dc; ch 1; sl st in top of ch 3; sl st to ch 2 space. Round 4 – 7: Repeat round 3, increasing in each ch 1 space. Sl st into top of ch 3; sl st to ch 2. Round 8: Ch 1; 3 sc in ch 2 space; 1 sc in each dc & ch 1 space across; 3 sc in ch 2 space. Repeat all the way around; join with sl st in 1st sc. Fasten off. Work in loose ends. Now that you have mastered the Granny Square, you may wish to make several for an afghan or lap robe. A number of years ago, I made an afghan out of leftover yarn from other projects. Each square was a different color, and I joined each square with a round of black. The afghan had a stained glass effect, which was very pretty. Note: This pattern works well with any size hook and yarn weight, but the finished square will vary. If making an afghan using this pattern, a thicker yarn with a bigger hook will make a warmer afghan. Keep in mind the 100% cotton is the only yarn which works best for dishcloths though. It is washable, durable and priced reasonable enough to toss in the compost pile when it is no longer usable for your dishes. © 2008 Beginner Crochet. All rights reserved.